Our Two-Tone Banded Cardigan is structured but easygoing, tailored but fluid. With a lone button, it moves with you; with an open V-neck it breathes; and with a peep of color, there’s a little secret, too! You knit this cardigan in one piece from bottom to top, then work the back and fronts separately. Join the shoulders together, then pick up for each sleeve and knit in the round down to the cuff. To finish, pick up and knit a different-color placket, fold it back and attach for a hearty edge. 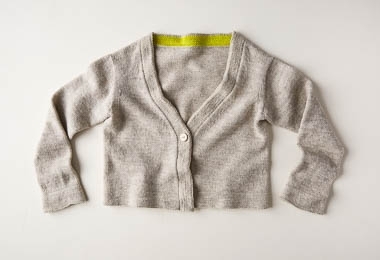 For our Two-Tone Banded Cardigan, we used our Good Wool for the main yarn, an undyed 100% Andean highland wool available only in the five shades of the sheep that grew them; and for the placket, we used Posy, our merino-cashmere-nylon blend, available in 18 glorious hand-dyed shades! Please click Product Details, above, for more information about materials, gauge, and sizing. Yarn A: 3 (3, 4, 4, 5, 6) skeins of Purl Soho’s Good Wool, 100% Andean highland wool. Each skein is approximately 383 yards/100 grams; approximately 1005 (1115, 1275, 1410, 1580, 1720) yards required. We used the color Winter Grass. Yarn B: 1 (1, 1, 1, 1, 1) skein of Purl Soho’s Posy, 75% superwash merino wool, 15% cashmere, and 10% nylon. Each skein is approximately 318 yards/100 grams; approximately 170 (180, 195, 205, 215, 225) yards required. We used the color Sour Gooseberry. A 1-inch button. We used Purl Soho’s Large Shell Button in Brown. SAMPLE: The sweater pictured here is size 38 inches modeled with 6 inches of ease.